Puck Treasures looks to find those hidden hockey treasures from the past and present, and gives them their proper remembrance. Seen an interesting piece of hockey apparel? Send us an email at puckdaddyblog@yahoo.com. Stumbling around eBay.com recently, I found one of those hidden hockey gems that get my podcasting brother Jeff Marek all hot and bothered: an NHL referee contract from 1967-68. This contract belonged to the late Vern Buffey, who went on to author a well-received book called “Black & White & Never Right” in 1983. He also once had Boom-Boom Geoffrion throw both his gloves and his stick at him in a 1963 game, which we believe would have clicked well on YouTube. What did Buffey make back in 1968, as compared to today? 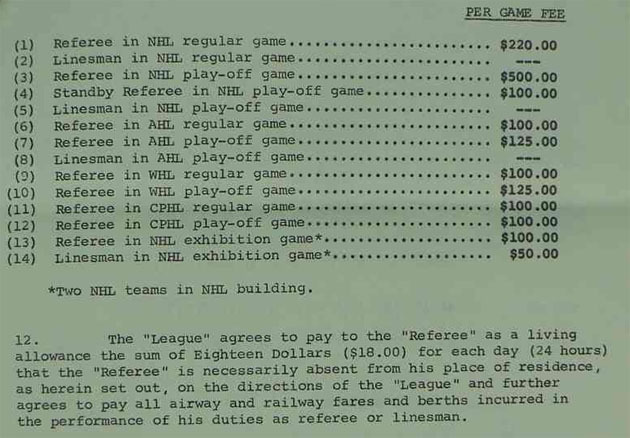 As you can see, his regular season game salary was $220; adjusted for inflation, that’s $1,489.40 per game today. His Stanley Cup Playoff salary was $500 per game; again, adjusted for inflation – a dollar in 1968 had the same buying power as $6.77 today – that was the equivalent of $3,385 in 2013. His base salary was $12,500 for the 74-game season. So his annual salary was $84,625, adjusted for inflation, without (we assume) the postseason bonuses and such. How does that compare with today’s zebras? Oh, they're doing much better, thanks. Some people are under the impression that hockey referees do not make a whole lot of money. Those that believe this are wrong. The referees make between $110,000 to $255,000 each year. The linesmen earn between $70,000 to $162,000 per year. The average pay for a referee is between $115,000 to $255,000 each year. This is an average payment of $1,402 to $2,682 per game. So just remember: He’s not only screwing your team, but he’s making as much as a CEO in San Diego. But compared to the players, referees are earning less than minimum wage. The average NHL player salary in 1970 was $18,000; Buffey was making $12,000 two years earlier as an official. The average player salary in 2011-12 was $2.4 million in the NHL ... so yeah, there's a larger disparity between the players and those officiating them now than in 1968.